It appears this computer and the technical support engineer's computer are on the same local network. This tech support account is currently configured to provide remote support though the Internet. To support computers on the same network, this account needs to be configured for LAN support. Please notify your technical support engineer that you've received this message so the appropriate configuration adjustments can be made. If you would like to use your remote support account on your LAN or your trying/testing the system, then configure your support account for LAN support by entering your computer's private LAN IP address in the "Currently Configured Address" field on your account's main page and click on the update button to save the change (Step 1). ** Both LAN and Internet support is disabled until you've properly configured port forwarding and successfully tested the router's port forwarding configuration from the Internet using the Test Viewer button on your main user page. Once you've entered and updated the IP address on your main user page to be that of your computer's private LAN IP, go to another computer on your local network that you have access to and login for remote support. Open a web browser and load our homepage. Then enter your viewer id number in the field labeled "Login Below for Remote Support". Hit enter on your keyboard or click the login button. Don't RDP to the other computer on your network or the Internet to test, physically login to the console. ** Using Microsoft RDP TCP port number for account testing or use is not recommended. Both the tech side and the client side will work through Microsoft RDP (Remote Desktop Protocol), Microsoft Terminal Server, and even Citrix sessions. This means the client or the tech viewer software can be in a RDP session. If your ready to provide remote support through the web then use the link below to discover the various ways your end-users can get support from you. Click here to see more options of how users gain access to get support from you. From this page you can copy the html code for adding a login form to your own web site - just paste it into your web page. Click here to set viewer options like displaying the toolbar by default, screen scaling, etc..
Click here to upload your logo or other image to brand pages your clients see when providing them with remote support. Internet pc support solution: PC remote support is available to you in a hosted solution where you have no web site or web site links to maintain, no hardware to buy, and no need to spend a thousand dollars per license, seat or computer. Remotely access and control desktops over the web with no limits. If the remote pc is connected tot he internet and works then you can remote control it over the Internet - no limits. If you prefer the application version of remote control support through the web, we have that too. 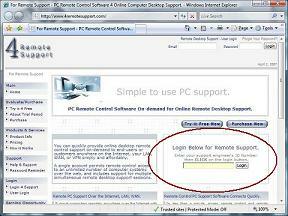 Our 4Support.exe remote pc support program can be places on your website for your users to download and connect to you for remote support over the web. The program is small and fast and all it requires, and it prompts for it, is your user account and then it remotely connects to you. The you have remote access and control of the remote desktop to solve the problem the end user or customer is having.